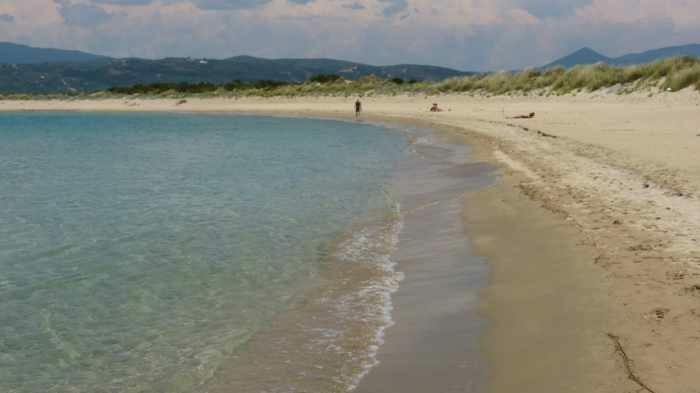 Although there are dozens of must-see places on my Greece travel wish list, only 13 are beaches per se (though many of the other spots are located at or near beaches I’d love to visit). All are stunning, some are world-famous, and each has a unique appeal, distinctive feature or superlative natural beauty I want to witness in person at some point during my lifetime, even if only briefly or from afar. My beach bucket list (no pun intended) includes five on Crete — the Balos lagoons, plus Preveli and Vai, Matala, and Stefanou/Seitan Limania; Navagio (better known as Shipwreck Beach) on Zakynthos; Porto Katsiki on Lefkada; Myrtos on Kefalonia; Simos on Elafonisos island in the Peloponnese; Manganari on Ios; Papafragas on Milos, and Agios Demetrios on Alonissos. Though not technically a beach, the Giola lagoon on Thassos is right up there, too. Until last spring, there had been 14 beaches I particularly wanted to see, but last May I finally got to visit the incomparable Voidokilia in the Messenia region of the Peloponnese. Voidokilia first enthralled me in 2011 when the Greek National Tourism Organisation published an aerial photo in the Beaches Album on its Visit Greece Flickr page. Voidokilia’s semicircular arc of light brown sand, strikingly similar in shape to the Greek letter Omega Ω, seemed surreal and almost other-worldly. It looked too perfect to be natural. I instantly wanted to see it, but didn’t foresee having the opportunity anytime soon. 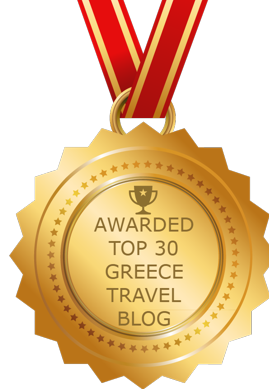 We had been hooked on island hopping at the time, and didn’t have a Peloponnese holiday in our near-term plans. But in 2016 we finally made our first foray into that part of Greece, visiting several places in the eastern Peloponnese, and we paid the region a return visit last year to explore some of its southern and western reaches. I was excited when I discovered that Voidokilia was one of the top attractions on our scheduled driving route along the Messenian Gulf coast. Since Voidokilia was the first bucket list beach I was going to see, I nervously wondered if it would live up to my lofty expectations. But it didn’t disappoint. If anything, it made an even better impression than I had imagined. 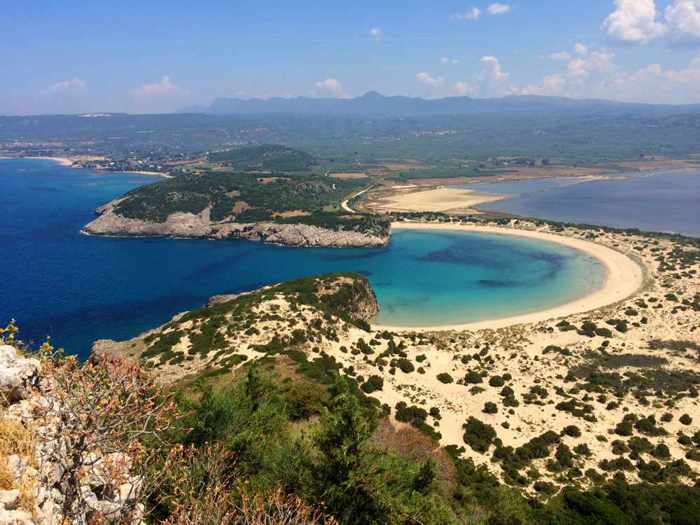 I gasped when I first observed Voidokilia from a lookout point in the Navarino Castle, and when I later walked along its soft brown sand a short time later, and gazed across the sparkling turquoise bay it encircles, I felt like I was living a dream. I was utterly gobsmacked, as some Brits might say. I now like to describe the experience as a personal OMG moment — though I pronounce it O-Me-Ga instead of Oh-My-God (pun intended this time). I savoured every second I was there, and now consider Voidokilia one of my favourite beaches anywhere in the world. I will go back again. I did take plenty of photos, of course, but I’m not entirely happy with how they turned out — they simply don’t make Voidokilia look as stunning as it actually appears in person. I suppose I was just too busy enjoying the moment and the captivating scenery around me to pay more attention to what I was doing with my camera. I have posted some of the images on page 2, so you can be the judge. But I really think you should just go and see Voidokilia for yourself. It truly is a marvellous sight. Below is a video that I believe does do justice to Voidokilia’s striking beauty. Beneath that is a link to page 2, where you can see our photos as well as a few more videos of this fantastic place in the Peloponnese. This 5.5-minute film from Studio Gaël Arnaud features stunning drone views of Voidokilia as well as the hilltop Paleokastro (Castle of Navarino) from which I shot some of my Voidokilia beach photos in May 2017.